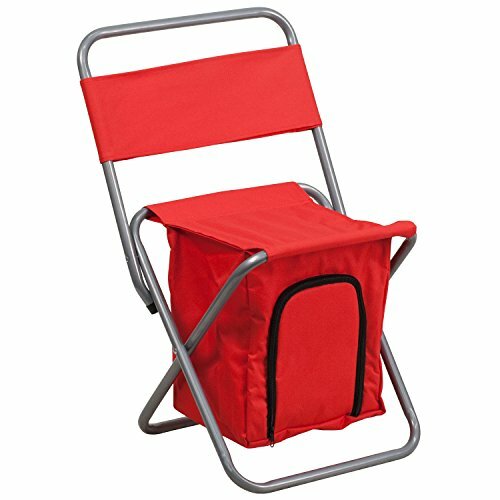 This folding chair is the perfect solution for outdoor seating with the inclusion of a storage compartment. The storage compartment is located under the seat, so it is out of the way. The storage compartment includes a zipper in the front and back to easily retrieve snacks. The best part is that the zippered storage is insulated to help keep your food and beverages cooler longer. You can take this chair with you for camping trips, sporting events, at the beach, while fishing or just to hang out in the backyard. The lightweight design allows for easy transport from place to place. The chair is fully collapsible, so you can store away when no longer in use.